The “referendum” in Crimea revealed Vladimir Putin’s partners in the EU. Most are minority radical parties which, according to his design, have to undermine the EU’s already quite unwieldy system from the inside with Moscow’s support Putin’s annexation of the Crimea has again drawn attention to the political fifth column in the EU – the oftentimes marginal radical parties that voiced their support for the Kremlin’s actions. They are a political motley crew, ranging from the far right to the far left, but are not afraid of finding themselves in one company with each other and Moscow. The easiest way to see who in the EU supports Putin’s annexation of the Crimea is to browse through the list of “international observers” at the “referendum” Moscow staged on the peninsula. They include MPs representing the Freedom Party of Austria (FP&#214 in the National Council. The FP&#214; is a far-right radical party, which did not prevent it from becoming the third biggest party in Austria. It dispatched its “observers” to the Crimea and they, of course, saw no violations there. One of them, Johannes H&#252;bner, said that everything went well during the vote. At a press conference following the pseudo-referendum, FP&#214; Chief Heinz-Christian Strache lambasted the Austrian government for not sending any official observers. Strache only forgot to mention who paid the travel and accommodation expenses for his Parteigenossen who went to the Russia-occupied territory. According to profil.at, an Austrian media outlet, the sponsor was the Eurasian Observatory for Democracy and Elections led by Belgian far-right radical activist Luc Michel, a long-time supporter of Putin. The first place on the list of Europe’s best-known right-wing radicals is shared by the Hungarian party Jobbik and France’s National Front (FN) led by Marine Le Pen. Both parties dispatched their representatives to the Crimea. There is some background to this decision. The Russians tried to actively cooperate with these political forces throughout 2013. In May, Jobbik’s leader G&#225;bor Vona was in Russia where he had an open discussion with the Kremlin’s ideologist Aleksandr Dugin. Thus, the reaction of his party’s representatives, who called the Crimean vote “exemplary” and “a triumph of a community’s self-determination”, came as no surprise. The Hungarian radicals would like to transfer this “triumph” to Zakarpattia (Transcarpathia), a Ukrainian region bordering on Hungary, and have already publicly declared this intention. Who are Vladimir Putin's pals, the Night Wolves, motorcycle gang? So it’s odd that Russian President Vladimir Putin has struck up an enduring friendship with the group’s leader, Alexander Zaldostanov, a man nicknamed ‘The Surgeon’. Indeed, Mr Putin’s links to the group are considerable enough that he was accidentally put on a blacklist by Finnish authorities, banning him from entering the country. Finnish authorities later said it had been a big mistake and they had ordered the banning order to be removed. Mr Putin first met the bike group in 2009 – a stunt that his detractors viewed as another of his macho photo opportunities. But Mr Putin’s links to the group seem sincere. Mr Putin was once four hours late for a meeting with former Ukrainian leader Viktor Yanukovych because he had been touring the Crimea with Mr Zaldostanov. Last year, Mr Putin awarded Mr Zaldostanov with an Order of Honour for his “active work in the patriotic upbringing of the young”. In return, Mr Zaldostanov has praised the President for his attempts to "restore Russia's greatness". The verdant forests that abut the Black Sea are home to perhaps the richest ecosystem in all of Europe. That’s changing fast—and not only because of the 2014 Sochi Olympic Games, which saw miles upon miles leveled to make room for luge tracks and stadiums. Russian president Vladimir Putin and other top government officials are also seizing huge swaths of public land and erecting luxury villas. The other activist, a geologist named Evgeny Vitishko, wasn’t so lucky. In February, he began serving three years in a penal colony, after a court reversed the 40-year-old’s suspended sentence following a separate arrest for swearing in public. Politics - Euronazis: Who Supports Putin in the West? Full list of foreign observers to a Crimean pseudo-referendum has become public. Names of “friends of Putin” (who doesn’t stop claiming that there has been a “fascist coup” in Ukraine) will make you consider very carefully, who should be called a fascist. Furthermore, Ukrainian diplomats have published information on European political forces, representatives of which back Russia’s aggressive stance toward Ukraine. The list of “foreign observers” at the “referendum” in Crimea is quite impressive, as there is a number of ultra-right and neo-nazi politicians among “Putin’s friends”. UNIAN has already partly covered the story on”achievements” of most of them in their home countries, disguised with the ideas of nationalism. A more detailed document is available now. The main behavioral model of European ultra-right political forces is defending an indigenous nation and searching for enemies. Such enemies are often found assigned amongst migrants or national minorities. The party “Jobbik” - Kremlin’s satellite in Hungary – uses anti-immigrant, anti-Roma and anti-Semite rhetoric on regular basis. For instance, the party leader G&#225;bor Vona calls for restricting birthrate for Gypsies, taking gypsy children away forcefully from their “lazy parents” and placing these children in social facilities. Among party supporters there are many young men, dressing up in pseudo-Nazi uniform, who are seriously concerned with the “Jewish colonization of Hungary”. G&#225;bor Vona repudiated anti-Semitism and tried to prove that "Jobbik" has nothing to do with this idea. But in 2012, one of the members of the party called to make a list of Jews who pose a threat to the security of Hungary, thus provoking a huge scandal. As a result, at the European Jewish Congress "Jobbik" was referred to as the neo-Nazi party. Actually, modern neo-Nazis in Hungary have claims to all the neighboring countries. In particular, they do not mind "chopping off" Transylvania from Romania and Transcarpathia from Ukraine. Naturally, using the guise of protecting ethnic Hungarians. Sounds familiar? World War II also began with the return of "ancestral lands" and, unfortunately, has not limited to the restoration of historical "justice". In this respect, it is not surprising that “Jobbik” backed Putin in his implementation of a plan of Crimea’s annexation. Even more, it is believed that Kremlin has been quite generous in financing its Hungarian “friends”. Apparently, in anticipation of Russian support in their issue, representatives of Spanish right-wing parties “Catalan Platform” and “People's Party” have recognized a pseudo-referendum in Crimea. “Catalon Platform” in particular, speaks against “Muslim invaders” and seeks independence for Catalonia. In this regard, the example of the “referendum” in Crimea can be very useful for them. It is even more interesting for the People’s Party. While in opposition, it approved the actions of the Spanish government in its fight against terrorism, especially regarding suppressing the extremist ETA, which spoke for the independence of the Basque country. Now, while in power, the People's Party does not support the referendum in Catalonia. In this regard, it is surprising that its representatives believe Crimean referendum to be legitimate and justified. But they explain this illogical move quite simply. They say that Crimea has not voted for independence but for reunification with Russia (especially since half a century ago it used to be one country). While Catalonia wants to completely break away from Spain. Members of the Belgian far-right-wing separatist party “Vlaams Belang”, represented in Crimea by three “observers”, also advocate the independence of Flanders from Belgium. This is political force was earlier noted for its xenophobia and discrimination of Belgians who, in its opinion, do not adhere to "traditional Flemish values". It even reached the point when the Belgian Court of Appeal condemned Vlaams Belang for discrimination against immigrants. In fact, after that, the party was even forced to review its political program. French neo-Nazis from the party “National Front” are just as ardent supporters of Kremlin regarding the annexation of Ukrainian territory. Like the Hungarians, they have their “enemies” – Muslims. National Front and its leaders were several times in the center of scandals when they were accused of anti-Semitism and racism. For example, the National Front favors a ban for special menus at schools for Muslim students. They also compare Muslims who perform namaz on French streets with the German occupiers during the Second World War. By the way, the National Front candidate himself has called the victory of the party in the recent local elections in the Var department of the town Brignoles “the Nazi occupation”. After this, he was suspended from participation in municipal elections by his party. Serbian and Bulgarian nationalists, in their turn, are united with love for Russia and Putin by a combination of several common ideas, the main of which is religion. And the Bulgarian "Ataka" and Serbian "Dveri" are deeply religious, therefore the Orthodox faith is often more important for members of these parties than ethnic issues. Hence, there is an attraction to the Russian Orthodox Church and, as a consequence, to the Kremlin. In addition, they are united by two ideas: anti-immigration policy and the opposition to the issue of European integration. Factions in Tsar Vladimir's court crystallize around institutional interests, charismatic individuals, common ideas, or shared self-interest -- and even around sports. ST. PETERSBURG, Russia — Weeks after President Vladimir V. Putin annexed Crimea in March, an obscure regulatory board in Moscow known as the Market Council convened inside an office tower not far from the Kremlin to discuss the country’s wholesale electricity market. It is a colossal business, worth 2 percent of Russia’s gross domestic product, and a rich source of fees for the bank that had long held the exclusive right to service it. With no advance notice or public debate, though, the board voted that day in April to shift that business to Bank Rossiya, a smaller institution that lacked the ability to immediately absorb the work. For Bank Rossiya, it was a tidy coup set to yield an estimated $100 million or more in annual commissions, yet it was hardly the only new business coming in. State corporations, local governments and even the Black Sea Fleet in Crimea were suddenly shifting their accounts to the bank, too. In a matter of days, Bank Rossiya had received an enormous windfall, nearly all from different branches of the Russian state, which was delivering a pointed message. In late March, the United States had made Bank Rossiya a primary target of sanctions, effectively ostracizing it from the global financial system. Now the Kremlin was pushing back, steering lucrative accounts its way to reduce the pain. The reason the Kremlin rushed to prop up Bank Rossiya is the same reason that the United States, and later its European allies, placed it on the sanctions list: its privileged status as what the Obama administration calls the “personal bank” of the Putin inner circle. Built and run by some of the president’s closest friends and colleagues from his early days in St. Petersburg, Bank Rossiya is emblematic of the way Mr. Putin’s brand of crony capitalism has turned loyalists into billionaires whose influence over strategic sectors of the economy has in turn helped him maintain his iron-fisted grip on power. Now the sanctions are testing the resilience of his economic and political system. Even as President Obama argues that the measures aimed at Mr. Putin’s inner circle are pinching Russia’s economy and squeezing the tycoons who dominate it, many of them have mocked the sanctions as a mere nuisance, the economic equivalent of a shaving cut, while the Kremlin has moved rapidly to insulate them. Woven deeply into the Putin system is Bank Rossiya. Founded as the tiniest of banks in the twilight of the Soviet era, Bank Rossiya, through staggering, stealthy expansion backed by the largess of the state, now has nearly $11 billion in assets. It controls a vast financial empire with tentacles across the economy, including a large stake in the country’s most powerful private media conglomerate, a key instrument of the Kremlin’s power to shape public opinion. How well the bank survives in a time of sanctions may ultimately be a barometer of whether economic pressure is enough to make Mr. Putin stand down at a time when neighboring countries, especially in the Baltics, are increasingly anxious about a newly aggressive Russia. Mr. Putin came to power vowing to eliminate “as a class” the oligarchs who had amassed fortunes — and, to the new president’s mind, a dangerous quotient of political sway — under his predecessor, Boris N. Yeltsin, in the post-Communist chaos of the 1990s. Instead, a new class of tycoons have emerged, men of humble Soviet origins who owe their vast wealth to Mr. Putin, and offer unquestioning political fealty to him in return. “These guys emerged from scratch and became billionaires under Putin,” Sergei Aleksashenko, a former deputy finance minister and central banker, said in a recent interview. If the modern Russian state is Kremlin Inc., Mr. Putin is its chief executive officer, rewarding his friends with control of state-owned companies and doling out lucrative government contracts in deals that provoke accusations of corruption but have the veneer of legality under the Putin system. This inner circle coalesced around Mr. Putin as he began his unobtrusive rise, from a middling career as a K.G.B. intelligence officer to a midlevel functionary in the office of St. Petersburg’s mayor. One of these loyalists is Bank Rossiya’s chairman and largest shareholder, Yuri V. Kovalchuk, a physicist by training, sometimes called the Rupert Murdoch of Russia for his role as architect of the bank’s media interests. Other Bank Rossiya shareholders include several of the country’s wealthiest men, the son of Mr. Putin’s cousin and even an old St. Petersburg friend of his, a cellist who was formerly first chair at the fabled Mariinsky Theater. The Kremlin has long denied giving Mr. Putin’s friends preferential treatment. But in acquiring many of its holdings, the privately held Bank Rossiya benefited from Kremlin directives that allowed it to purchase prize state-owned assets at what critics have called cut-rate prices. Meanwhile the true extent of its holdings is obscured by shadowy corporate shell structures that nest like matryoshka dolls, one inside the next. Records show that the ownership of one powerful television advertising company linked to Bank Rossiya, for example, is buried in offshore companies in Panama, in the British Virgin Islands and even at a simple concrete house on Karpathou Street in Nicosia, the capital of Cyprus, whose owner had no idea of the company registered there. In the early days of the conflict over Ukraine, several European leaders expressed deep ambivalence about alienating a Russia that under Mr. Putin’s rule has become immeasurably wealthier than it ever was under the Soviet system. Russia has been a sought-after partner in the globalized economy, a source of cheap natural gas for Europe, where wealthy Russians have also purchased billions of dollars in real estate in places like the Cote d’Azur and the Belgravia district of London. But that resistance has to some extent eroded, especially since the downing of a commercial airliner over eastern Ukraine in July that killed 298 people. This month, despite an edgy truce between pro-Russian separatists and government forces in Ukraine, the West announced a new round of sanctions aimed not just at Mr. Putin’s powerful cronies but at the Russian economy more broadly. Some argue, however, that this punitive strategy fundamentally misunderstands the way the Putin system works. Gennady N. Timchenko, an oil trader and Bank Rossiya investor whose own holding company is also under sanctions, admitted in a recent interview with Itar-Tass to a measure of annoyance. He was unhappy that his Learjet had been grounded because of sanctions, and that he could not vacation in France with his family and dog, Romi, which happens to be the offspring of Mr. Putin’s beloved black Labrador, Koni. Last edited by Hannia; 8th October 2014, 03:54. In the Kolomna district of St. Petersburg, near the shipyards, is a 19th-century palace that belonged to Grand Duke Aleksei Aleksandrovich, a son of Czar Aleksandr II. Lately its elegant halls — this one in Baroque style, this one English, this one Chinese — have been repurposed as the House of Music, a training academy for classical musicians. The academy’s artistic director, Sergei P. Roldugin, has his own singular back story. He is an accomplished cellist and musical director. He is certainly not a businessman, he explained at the palace the other day. “I don’t have millions,” he said. And yet, on paper at least, he has a fortune that could be worth $350 million. That is because, years ago, he said, he acquired shares in a small bank run by men close to his old friend Mr. Putin. He had met Mr. Putin in the 1970s, and is godfather to his eldest daughter, Maria. He opened the House of Music with Mr. Putin’s patronage. Last year, he recalled, the president asked him for a favor: would he organize a private concert? So Mr. Roldugin traveled to the president’s official residence west of Moscow, Novo-Ogaryovo, with three young musicians: a violinist, a pianist and a clarinetist. They played Mozart, Weber and Tchaikovsky — so well, he said, that Mr. Putin invited them to play again the next night for the same small group of friends who had gathered there. The concerts are a glimpse into the small, remarkably cohesive group of men who came together around Mr. Putin as the old order was crumbling and a new, post-Soviet Russia was taking form. When the last Soviet leader, Mikhail S. Gorbachev, began to allow the first experiments in private enterprise in the 1980s, St. Petersburg was still Leningrad, an impoverished shadow of the czarist capital it had been. An early adapter was Mr. Kovalchuk, a physicist at the Ioffe Physical Technical Institute, who founded an enterprise to turn its scientific work into commercially viable products. Another was Mr. Timchenko, a former Soviet trade official, who formed a cooperative to export products from an oil refinery on the Baltic Sea. What brought Mr. Putin into their orbit was the fall of the Berlin Wall in 1989. After five years as a K.G.B. officer in East Germany, Mr. Putin was part of a wave of embittered military and intelligence officers who withdrew from the Soviet satellites and returned with few prospects to a changing homeland. Still with the K.G.B., Mr. Putin came into contact with one of his former law professors: Anatoly A. Sobchak, a reformer who had just become chairman of the Leningrad legislature (and would later become mayor of the renamed St. Petersburg). He asked Mr. Putin to become an adviser, to smooth relations with the still-powerful security services. And when the Soviet Union collapsed, Mr. Putin joined Mr. Sobchak full time, overseeing a new committee on foreign economic relations. The committee worked closely with Russia’s emerging entrepreneurs, regulating imports and exports and distributing city contracts. Some of the deals became controversial, notably one during the hungry winter of 1991-92, of a deal to barter oil, metal and other products for food. Virtually none of the food ever materialized, and a City Council committee unsuccessfully sought to have Mr. Putin fired for incompetence. For all that, Mr. Putin was considered an efficient, unprepossessing administrator, helping businessmen cut through the bureaucracy. His fluency in German was useful with the many Germans seeking a foothold in the city. Among them was Matthias Warnig, formerly of the East German secret police, the Stasi, who opened one of the city’s first foreign banks, Dresdner. Mr. Putin was, in short, both collecting new friends and laying the foundation for what would evolve into the system of personalized, state-sponsored capitalism now at the heart of his power. “It was a favorable environment for such a bouquet of friends to appear,” explained Mikhail I. Amosov, who served on the City Council at the time. One enterprise that received an infusion of municipal aid was Bank Rossiya. The bank had been founded in 1990 at the initiative of the city’s branch of the Communist Party, with party funds as capital. It was also believed to handle the banking needs of the K.G.B. But with the collapse of the Soviet Union, it was all but bust. Mr. Kovalchuk stepped in. In December 1991, he and a group of friends secured a small loan from a local shoe manufacturer and bought the foundering bank. The investors included three other alumni of the Ioffe Technical Institute — the physicists Victor Y. Myachin and Andrei A. Fursenko, and Vladimir I. Yakunin, the institute’s former head of international relations. The reconstituted Bank Rossiya quickly became a favored city institution. At the mayor’s instruction, according to news reports, the city opened several large accounts there, fattening the bank’s coffers and setting it on its way. Business connections became deeply personal connections. In 1996, Mr. Putin joined seven businessmen, most of them Bank Rossiya shareholders, in forming a cooperative of summer homes, or dachas, called Ozero, or “lake,” in the northeast of St. Petersburg. The group has come to have an outsize influence on Russia’s political and economic life. The cooperative included the homes of Mr. Putin, Mr. Yakunin, Mr. Kovalchuk, Mr. Fursenko and his brother Sergei, Mr. Myachin, and Nikolai T. Shamalov, who headed the St. Petersburg office of the German manufacturer Siemens and would also acquire a major stake in Bank Rossiya. Vladimir A. Smirnov, a St. Petersburg businessman with an exclusive contract to supply the city’s gasoline retailers, served as Ozero’s director. And there was Mr. Roldugin, the cellist. “The issue was that I needed to have some money,” he said, adding, “There was no money for art anywhere.” His investment, he said, involved “a lot of manipulations” and required him to take out a loan. Today the bank lists him as owner of 3.2 percent of its shares. Mr. Putin’s stint in St. Petersburg ended in 1996, when his boss lost his bid for re-election. Soon Mr. Putin had a new boss, President Yeltsin. And after Mr. Yeltsin unexpectedly elevated him to prime minister and then acting president on New Year’s Eve in 1999, the fortunes of many of his friends — and their little bank — began to be transformed. He had arrived in Moscow as a midlevel apparatchik in ill-fitting suits, had ascended to power as a thoroughly unexpected president and won his first presidential election in 2000 on the crest of war to suppress separatists in Chechnya. By 2004, Mr. Putin had become the paramount figure in Russia, winning a second term with 72 percent of the vote, in a race tainted by allegations of strong-arm tactics and vote rigging. Yet Mr. Putin probably would have won a fair election easily, too. The Russian economy, buoyed by high oil prices, was booming, creating huge fortunes and also lifting the middle class. The long era of post-Soviet gloom seemed done. Not many people yet understood that in the middle of Russia’s prosperity, the men in the tight circle close to Mr. Putin were becoming fabulously wealthy, and increasingly powerful, in what critics now consider a case study in legalized kleptocracy. Bank Rossiya, which reported less than $1 million in profits the year before Mr. Putin became president, had grown steadily, but figures like Mr. Kovalchuk and Mr. Timchenko remained in the shadows. “I didn’t even know such names — Timchenko, Kovalchuk,” said Mr. Kasyanov, whom Mr. Putin dismissed as prime minister shortly before the elections. Net Worth $1.4 billion, according to Forbes. Chairman of the board and largest shareholder in Bank Rossiya. Target of sanctions. Led the investment group that bought the bank after the Soviet collapse. Member of the Ozero dacha cooperative, a community of lakeside homes owned by President Vladimir V. Putin and friends. Net Worth $14.5 billion, according to Forbes. Net Worth Not available. Declared government income in 2013 of $360,000. Senior aide to President Putin; their ties go back to the St. Petersburg mayor’s office in the 1990s. He and his brother Sergei were among the early investors in Bank Rossiya. Member of the Ozero dacha cooperative. Net Worth Rosneft shares worth roughly $169 million. 2013 salary: $50 million. President of Rosneft, the state-controlled oil company. Target of sanctions. Close Putin aide since their days in the St. Petersburg mayor’s office. Was Mr. Putin’s deputy prime minister from 2008 to 2012. Serves on boards of corporations that dominate Russia’s energy, aluminum and banking sectors, including Bank Rossiya’s. Was a member of the Stasi, the secret police in East Germany, when Mr. Putin was stationed there for the K.G.B. Both have said they met and became friends later, in St. Petersburg. Last edited by Hannia; 8th October 2014, 03:53. In sanctioning Bank Rossiya, the Obama administration would resurface the “cashier” allegation, though it offered no evidence that Mr. Putin has personally profited from the bank. Mr. Kovalchuk, who through a spokeswoman did not respond to requests for comment, in the past has attributed his bank’s success not to any special treatment but to sound investment and business decisions. Either way, Bank Rossiya’s holdings would increase tenfold during Mr. Putin’s second term. Critical to this remarkable growth was the bank’s ability to snap up assets, at knockdown prices, that had previously belonged to the state-owned energy company Gazprom. Those deals were documented in a series of reports published at the end of Mr. Putin’s second term by Boris Y. Nemtsov, a former deputy prime minister, Vladimir V. Milov, a former deputy energy minister, and others. “The total value of the assets exfiltrated from Gazprom,” they estimated, was $60 billion. An early deal involved one of the country’s biggest insurers, Sogaz. Bank Rossiya bought a controlling stake in Sogaz by acquiring shares that had been held by Gazprom. The bank paid around $100 million, according to Mr. Nemtsov and Mr. Milov, who later valued Sogaz at $2 billion. “Putin said, ‘Bank Rossiya, that’s it,’ ” Mr. Milov later told the Russian edition of Forbes. Sogaz became the insurer of choice for major state companies like Russian Railways, headed by Mr. Yakunin, and the growing oil giant, Rosneft, by then led by Igor I. Sechin, who had been Mr. Putin’s deputy in the St. Petersburg mayor’s office. Sogaz also bought 75 percent of a company called Leader that managed Gazprom’s $6 billion pension fund, Gazfond. The purchase price was $30 million, less than Leader’s profits that year alone, according to Mr. Nemtsov and Mr. Milov. It seemed to be a quintessential insider deal: The year before, Yuri Shamalov, son of the Bank Rossiya shareholder and Ozero member, had been appointed chairman of Gazfond. “Shamalov Jr., as head of Gazfond, sold shares in the company managing Russia’s largest private pension fund at a fantastically low price to the bank owned by his father,” Mr. Nemtsov asserted. At the same time, Mr. Kovalchuk, the bank’s chairman, began assembling a media empire that now controls some of Russia’s largest television and radio stations and newspapers. Bank Rossiya had already assumed management of the assets of Gazprombank, one of Russia’s largest. Now, Gazprombank purchased Gazprom Media Group, which owns five television and several radio stations. The price: $166 million. Two years later, Dmitri A. Medvedev, a Putin prot&#233;g&#233; and first deputy prime minister, put Gazprom Media’s value at $7.5 billion, or 45 times the purchase price. Not content merely to manage media assets, Bank Rossiya began buying up media companies of its own. In 2005, a subsidiary of Bank Rossiya bought a stake in Channel 5, a local television network owned by the St. Petersburg government. The price was $25 million. There was no competition. Channel 5’s value swelled in 2006, when regulators let it acquire frequencies in 30 regions across Russia. Soon after, Mr. Putin designated it a national broadcaster, able to reach 91 cities and 53 million people. Today, it is the country’s fifth-largest broadcaster. A year later, a Bank Rossiya subsidiary bought a controlling stake in Ren TV, today the country’s eighth-largest broadcaster. Once known for investigating government corruption and airing opposition views that were never allowed on state television, Ren TV over time became noticeably less critical. By 2008, Mr. Putin’s second term was ending and the Bank Rossiya media empire provided a supportive voice when, rather than recede from politics, he decided to serve as prime minister. Mr. Medvedev was elected president, while Mr. Putin largely retained control over the levers of government. Two years later, Mr. Kovalchuk scored his biggest prize — a 25 percent stake in Channel 1, a state-controlled network with the largest audience in Russia. The stake cost only $150 million, “an amazingly low price,” according to the newspaper Novaya Gazeta. The next year, Channel 1 reported profits of nearly $100 million. Then, in 2012, Mr. Putin announced he would seek a third term as president. Democracy activists were deeply alarmed but powerless. No one doubted he would win, though the economy had slowed and Mr. Putin’s men were targets of rising criticism, no longer hidden. To grasp how Bank Rossiya’s holdings extend around the globe — and how island tax havens and other tools of global finance may serve to obscure their true breadth — one place to visit is 13A Karpathou Street in Nicosia. This is the registered address of Med Media Network Limited, a company listed in a corporate flow chart connecting Bank Rossiya to a company called Video International. In a peculiarity of the Russian marketplace, broadcasters do not sell advertising time directly. They act through middlemen like Video International, which buy airtime wholesale, then sell to those who wish to advertise. Med Media is a major shareholder, holding a 20 percent stake. Except that Med Media’s address in Cyprus is hardly a corporate headquarters at all. It is a simple concrete home with a large ficus shading a small garden. The owner, Agathi Zinonos, has never heard of Med Media or any of the other companies registered there. Attempting to unwind Video International’s convoluted corporate structure requires going back to 2011. That is when Bank Rossiya and a couple of partners purchased the company, according to an interview given by Video International’s chief executive in 2013. Video International had controlled 70 percent of the advertising-placement market. But in the months before the sale, the government hastily enacted a new antimonopoly law, prohibiting national television networks from using advertising shops that controlled more than 35 percent of the market. Video International would have to abandon many of its contracts. But what looked like a debacle for Video International turned out to be a boon for Bank Rossiya. The new law depressed the company's value - and thus its purchase price. And while Video International gave up many contracts, its new owners managed to profit from the "lost" business: many of the networks simply brought the placement business in house - while continuing to pay Video International consulting and software licensing fees. Reflecting on the way the government's antimonopoly office has looked the other way, Mr. Aleksashenko, the former finance minister, invoked the saying "my friends get everything, while my enemies get the law. Among those taking part in the new arrangement was CTC Media, a company with several television channels that was partially owned by a subsidiary of Bank Rossiya. CTC continues to pay Video International around $80 million a year — but as a consultant. Yet while the arrangement allowed Video International to maneuver around Russian law, it may actually have placed CTC at risk of violating American sanctions. For though CTC is a Russian broadcaster, its headquarters are in Delaware and it is traded on the Nasdaq. The sanctions prohibit American-headquartered companies like CTC from doing business with entities that are majority-owned by sanctioned companies like Bank Rossiya. But whether Bank Rossiya retains a majority stake in Video International is impossible to ascertain. Records show that, on paper at least, its shares, held by a subsidiary, are down to 15 percent. Nearly all the rest of the shareholders are buried behind fronts like Med Media of Karpathou Street. Cyprus is one of the world’s busiest offshore financial-service centers, with one of Europe’s lowest corporate tax rates and laws that enable foreigners to incorporate companies within days. Nearly 270,000 companies are registered there, and many are shells created to shelter income while obscuring the real owners. Ms. Zinonos’s son, Zinon, who is listed as a Med Media director, is an administrator at Scordis, Papapetrou & Co., a Nicosia law firm that not only represents Med Media but helped create it. A partner there, Makis Chrysomilas, said his firm typically uses its own address or those of employees when establishing residence for shell companies. “We are lawyers for 4,000 or 5,000 corporations,” he said. Coming up with names for them can be a challenge, he explained. So he has taken names from a book listing the thoroughbred horses auctioned in the United States. He also has named companies after streets in London and other European cities. Cypriot laws enable the true owners of shell companies to remain secret. Of the eight corporations with shares in Video International, at least five, with a combined stake of 69 percent, are incorporated in Cyprus: Med Media, Namiral Trading Limited, Devar Investments Limited, Reibruk Limited and Attalion Investments Limited. Delving into their ownership produces yet more corporate shells, headquartered in Panama and the British Virgin Islands, equally opaque jurisdictions. A Video International spokesman would not reveal who was behind the shell companies, and said only that they had not been sanctioned. “Why is the shareholder structure specifically like that?” he said. “Because the shareholders decided so.” A CTC official declined to say what if any due diligence the company had done to determine if it was violating the sanctions. But he said CTC was working with the Treasury Department to ensure that it complied with the law. As for Bank Rossiya, he went on: “As far as I recall, this is a medium-sized bank. Personally, I did not have an account there, but I will definitely open one on Monday.” He later directed the presidential administration to begin depositing his official salary — roughly $7,500 a month — into a Bank Rossiya account. Mr. Putin’s efforts to protect the bank were not just symbolic. He ordered the Central Bank to provide assistance if needed. State-owned energy companies transferred accounts to Bank Rossiya, and the governors of St. Petersburg and the surrounding Leningrad region told state institutions in their jurisdictions to do the same, according to Russian news reports. Additionally, in the lower house of Parliament, the main party loyal to Mr. Putin provided the margin needed to rescind the law effectively limiting Video International to just 35 percent of the advertising-placement market. And on April 10, the Market Council stepped in. The council, which regulates Russia’s $35 billion wholesale electricity market, is a nonprofit organization with 22 members representing government ministries as well as major producers and suppliers of electricity. One of the council’s members is an executive at Inter RAO UES, a private enterprise spun off from the former state electricity monopoly. Its chief executive is Mr. Kovalchuk’s son, Boris; its board chairman is Mr. Sechin, the president of the state-owned oil giant Rosneft and one of Mr. Putin’s closest advisers. The council met at its office in Moscow’s World Trade Center. A spokeswoman declined to discuss the vote, except to say that a quorum attended, explaining that she did not want to contribute to an “anti-Russian” article. The decision to shift the business to Bank Rossiya, she said, was one of several routine actions taken during a regular meeting that day. In remarks published on the council’s website in May, its director, Maksim S. Bystrov, said Bank Rossiya had “brought us” a proposal with lower commissions than those charged by the previous bank, Alfa. But he declined to provide details, and Alfa Bank declined to comment. As the United States and Europe continue to ratchet up the economic pressure, it is an open question how long the government can continue to prop up the growing number of institutions faced with sanctions. Russia’s economy had been struggling even before the annexation of Crimea. The European Bank for Reconstruction and Development recently predicted that, with the added impact of Western sanctions and Mr. Putin’s retaliatory embargo on Western goods, the economy could contract next year. Other companies are lining up behind Bank Rossiya, hoping for bailouts. The government recently announced that it would pump $6.6 billion into two state-controlled banks whose access to foreign capital has been cut. And Mr. Sechin’s Rosneft has requested a $42 billion loan. The latest thing to sweep Moscow's culture of street demonstrations is a coalition of war veterans, patriotic politicians, nationalist bikers, and mixed martial artists. They call themselves the Anti-Maidan movement. The group's name signifies its opposition to the recent “EuroMaidan” revolution in Ukraine, and reflects its decidedly anti-Kyiv, pro-separatist position on the war in eastern Ukraine today. Announcing the movement's launch, the Combat Brotherhood veterans group, a co-founder of the movement, tweeted: We are creating Anti-Maidan. So now what, Ukrainians, do you see what all your screwing around has gotten you? Pictured left in the tweet above is Alexander Zaldostanov, one of the movement's leaders. Zaldostanov, also known as “The Surgeon,” heads the Night Wolves motorcycle club. The Night Wolves are well-known for supporting Vladimir Putin and celebrating the Kremlin's decision to annex Crimea and Sevastopol. Other names mentioned as key figures in the Anti-Maidan leadership include Great Fatherland party co-chairman Nikolai Starikov, world-class mixed martial artist and boxer Julia Berezikova, and Combat Brotherhood deputy head and Russian senator Dmitry Sablin. Already about 1,000 people have joined the movement, senator and “Combat Brotherhood” deputy head Dmitry Sablin told RBC. According to Sablin, Anti-Maidan expects to increase its size to at least 10,000 people, given that “applications to the organizers are arriving in large numbers.” A headquarters with co-chairs, along with an executive committee, will lead the movement. Numbers are important for the organization, said Sablin, because anti-maidanovtsy [Anti-Maidan members] will go to all major unsanctioned protests and numerically dominate the participants. “If an unsanctioned mass event is planned, then all members of our organization will arrive. If the action is local, we will assess the situation: Cossacks will go to some places, Combat Brotherhood members will go to others. In any case, their will always be more of us than them,” said Sablin. At unsanctioned events, Anti-Maidan promises to act peacefully, but says it will use force to restore order if necessary. “We will direct law enforcement to those provocateurs who through their words or actions are encouraging people to disorder. In some cases, if we see that someone is starting a fire or trying to burn tires then we will pull these people out of the crowd ourselves and transfer them to the police,” says Sablin. Fighters and experienced sportsmen, who are at least candidates for master of sport, will do this work. “It's better not to initiate provocations against us. We will stand shoulder to shoulder. Since our organization is mostly soliders, we know how to do this. We will not retreat nor run away,” Sablin stated. We are Russians, who hold the fate of our Motherland and the future of our children dear. We are uniting for the Anti-Maidan movement because we love Russia and want to preserve and protect our Great Country. We are standing together in order to prevent “color revolutions,” street disorder, chaos, and anarchy. We will not allow those forces in our cities who hate a strong and sovereign Russia and who receive approval and support from abroad. We believe only a sovereign Russia can guarantee a worthy life for our citizens. Therefore, all key decisions for our country should be made in Moscow, not in Washington or Brussels. We know the history of our country, the terrible cost our nation has paid to survive the breakdowns of order that have sometimes happened in Russia. We see the tragedy in Ukraine, where a fratricidal war in the Donbas began with the “Maidan” and street demonstrations and disorder. We are convinced that the clear position of the majority of Ukrainian citizens would have been to prevent the bloodshed and collapse of the government, but this was not so and it's not how events were reported. We are united, having realized all of this, to defend the constitutional order and law, as well as the traditional values of our society and the future of our country. We are resolutely announcing that we will not allow an armed overthrow of the legally chosen government, regardless of what pretty slogans these forces use to conceal themselves. Russia is our country. We are all Russia. And we will not allow her to be destroyed or covered with blood. We, the Anti-Maidan movement, are ready to defend our Motherland, her peace and stable development. We do not need great upheaval! We need a Great Russia! Immediately following the launch of Anti-Maidan, the movement sprung into action, just as Sablin imagined, to crash an unsanctioned gathering outside the Kremlin walls of supporters of Russian opposition figure Alexey Navalny and his brother, Oleg. According to one LiveJournal photo-blogger, the mixed crowd made for a “strange” night. In addition to protest-busting, Anti-Maidan has also organized an outdoor photo exhibition, titled “The Face of American Democracy.” The exhibition, held on Pushkin Square in central Moscow, displayed graphic pictures from American militarily conflicts and failed popular uprisings. However, experience with these types of projects shows the following: patriots in such projects are extremely weak—both physically and morally. And they work for next to nothing, but only for money. They do not have ideological conviction. Therefore, at the crucial moment, when you need them to go out and save the Motherland, they will not act until the receipt for their payment to save the nation has been signed. The next Anti-Maidan event is planned for Saturday, February 21. The movement has rented about 120 billboards around Moscow to promote the march at considerable cost, reported RBC. The Moscow mayor's office has sanctioned the event for up to 10,000 participants, and the march will proceed along Petrovka Street, culminating with a rally on Revolution Square, just outside the Kremlin. 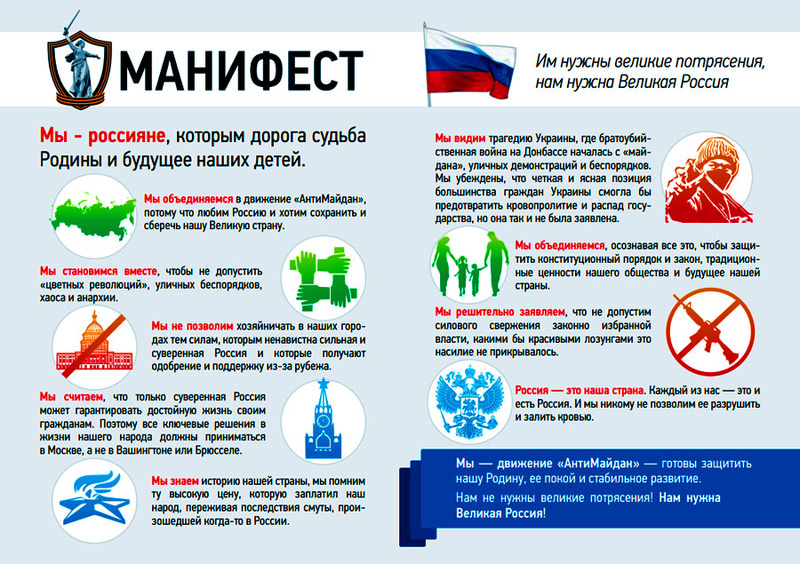 It's unclear what impact the Anti-Maidan movement might have on Russian street politics. So far, Anti-Maidan resembles a more militant version of the pro-Kremlin youth groups Nashi and Young Guard, created in 2005 after Ukraine's Orange Revolution to build a similar protest-busting capacity in Russia. MOSCOW—Thousands of protesters have gathered in downtown Moscow to demonstrate against what they describe as a “fascist coup” one year ago in neighbouring Ukraine. The demonstrators gathered near Red Square on Saturday to protest events in Ukraine, where a pro-European protest movement last year led to the ouster of the country’s Russia-leaning president on Feb. 21. Police said that 35,000 people attended, though those numbers were impossible to verify independently. Anti-Western sentiment in Russia, in part spurred by state television coverage of Ukraine crisis, has spiralled to new heights. Former Ukrainian President Viktor Yanukovych said in a recent interview with Channel One Russia that he would come back to Ukraine as soon as he had an opportunity, RIA Novosti reported. "I couldn't get rid of the thought of returning and leading the protest movement first, but everyone agreed that if I came back, the enemies would do anything to destroy me. My close associates were against my going to Ukraine. The events were unfolding rapidly, and I feel sorry that I couldn't have done that. As soon as I get an opportunity, I will return and will do my best to make Ukrainians' life easier," Yanukovych said. As UNIAN reported earlier, on February 21 last year former President Viktor Yanukovych fled from Kyiv, effectively abandoning the presidency of Ukraine. The country had seen several months of protests against Yanukovych’s rule, which ended in bloodshed, with over 100 protesters gunned down by snipers firing on them as they advanced towards the government quarter in Kyiv. Criminal proceedings have been initiated in Ukraine against Yanukovych, former Prosecutor General Viktor Pshonka and several other former officials on charges of murdering civilians. All of them are on the wanted list. On January 12, 2015, Ukrainian Interior Minister Arsen Avakov said that Interpol had declared wanted Yanukovych, former Prime Minister Mykola Azarov and other former Ukrainian officials. Ousted Ukrainian president Viktor Yanukovych has controversially spoken out from self-imposed exile in Russia, promising, exactly a year after he fled Kiev, to return to Ukraine to “ease people’s lives” and help stop the war. Yanukovych’s interview with Russia’s state-owned Channel One was his first public appearance since he gave two bizarre press conferences in Rostov-on-Don in February and March 2014, claiming he remained Ukraine’s president. In the year since he fled, Russian president Vladimir Putin has annexed Crimea, Russia-backed rebels have established breakaway republics in eastern Ukraine, and at least 5,600 people have died in the conflict. All times are GMT+1. This page was generated at 23:28.